Before we know the difference between Periapical, Radicular and Residual cysts, let us know what exactly a Cyst is – A Cyst is a “pathological fluid filled cavity lined by epithelium” . It consists of three parts – Wall or capsule, Epithelial lining and Lumen or Cavity. 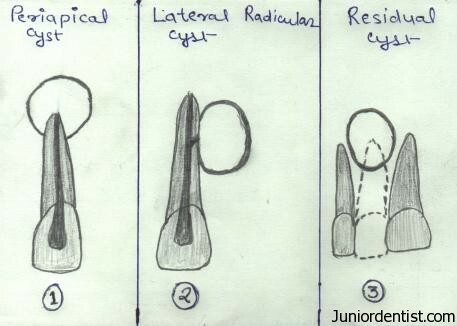 What is the Difference between Periapical, Radicular and Residual Cysts ? These are the True cysts lined by Epithelium, present at the apex of Non Vital tooth which are stimulated by inflammation. It is defined as an Odontogenic Cyst derived from Cell Rests of Malassez that proliferate in response to inflammation. It is the most common type of Cyst seen in the oral cavity as it constitutes approximately half to three fourths of the cysts in oral cavity. The incidence of Periapical cyst in the Maxilla is 3 times as compared to Mandible. Symptoms: Asymptomatic in some cases as the cyst is slow in progression and pain is seen when the cyst gets infected and expansion is rapid after infection. These are the radicular cysts which are present on the mesial or Distal aspects of the root mostly seen at the opening of lateral accessory root canals of offending tooth. These are the radicular cysts which remains even after extraction of offending tooth. These are round to oval radiolucency of variable size within the alveolar ridge at the site of extracted tooth. thank you Dr.Varun for posting an article or blog about dentistry..its really a great help..especially those who are reviewing for exam..even to practicing dentist..awesome..thanks a lot..